"Death shall come on swift wings to him who disturbs the peace of the King." When I was a child, young enough to be left in the care of a cooperative babysitter who let me stay up to watch late night horror movies, there was nothing scarier to me than an Egyptian mummy coming back to life and stalking those who had invaded the tomb in which it had been buried. I don't know to this day what it was about them that so rattled me, though it's worth noting that the Mummy was born of more recent folklore than the likes of Dracula or the Wolf Man, and back then kids like me lapped up stories about the curses that that supposedly afflicted those who desecrated the tombs of Pharaohs. To us it had an almost scientific plausibility, the work of a mysterious and ancient civilisation far more advanced than our own. If they could build the pyramids, who knows what else they could have come up with. 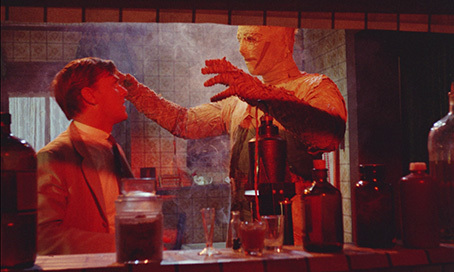 But I'm talking about the first Mummy movie, the one directed for Universal by cinematographer Karl Freund, which had a treacle-thick atmosphere, make-up by the great Jack Peace, and the inimitable Boris Karloff as the mummified Imhotep. The first sequel, The Mummy's Hand, had its creepy moments, but was afflicted by the presence of an unfunny buffoon, a creature that was to curse a number of otherwise fine horror works of the period. Hammer's 1959 incarnation was an exciting Freudian treat, and their final stab at the sub-genre, Seth Holt's Blood From the Mummy's Tomb, remains one of the best films from the studio's somewhat uneven later period. Sandwiched between them were two films that did not enjoy the same level of critical favour, the 1964 The Curse of the Mummy's Tomb, and the 1967 The Mummy's Shroud. It's this third film in the quartet that has been selected by Studiocanal for a dual format release as part of their ongoing project to restore as many Hammer Horror works as they are able to get their hands on. The film, it has to be said, does not get off to the most convincing of starts. A neat enough low-budget solution to telling the story of sibling rivalry in the Pharaoh family through voice-over and wall paintings gives way to battle for control of the palace involving small handful of warriors and a makeshift set. The Pharaoh soon realises that he is doomed (that's what happens when you only have four guards), so orders his loyal head slave Prem, who looks like an English geography teacher with a tan, to transport his young son and heir Kah-to-Bey to safety. Accompanied by a party of slaves, they embark on a long trek through what the voice-over assures us is a desert wilderness, but is actually a sand and gravel quarry in Buckinghamshire, which is unfortunately just what it looks like. Shot close to the quarry wall, the sand has been freshly shovelled into small piles (are these meant to be miniature dunes?) and weathered by recent rainfall, making it hard to imagine how any of this lot died of exhaustion and dehydration. When Kah-to-Bey can go no further, the survivors make camp and Prem waits with him while he dies and then covers his body with a sacred shroud. About four thousand years later – 1920 to be exact, two years before the discovery of Tutankhamun's tomb – a British archaeological party led by Sir Basil Walden (a typically stout turn by Hammer regular André Morrell) has become lost in this same pretend desert, pinned down by high winds and dangerously low on supplies. When the weather suddenly improves, they discover that they are camped close to a carving that points the way to the tomb for which they have been searching. It's once they get into the caves in which the tomb is located that things pick up a bit, thanks to regular Hammer cinematographer Arthur Grant's lamplight camerawork and the group's guarded enthusiasm about what they are about to uncover. Despite being warned off by angry local Bedouin Hasmid (Roger Delgado), whose family have been guarding the secret of the caves for centuries, the party locate what appears to be the sealed entrance to the tomb, and Sir Basil is promptly bitten by a poisonous snake. Should have listened to Hasmid, huh? 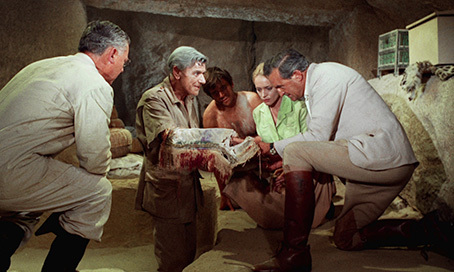 Minutes later, a rescue party led reluctantly by self-important blowhard and expedition money man Stanley Preston (John Philips) stumbles onto their location, and the group break into the tomb. Here they discover the sand-preserved body of Kah-to-Bey, whose body is still covered with a sacred scroll bearing a message that the group's language expert and resident psychic Claire de Sangre (a rather stilted Maggie Kimberly) is too frightened to read out. Back in the Hammer equivalent of Cairo, Sir Basil suffers a relapse from his snake bite, and the glory-hunting Preston has him secretly committed, leaving the way clear for him to hog the credit for finding the tomb. Infuriated by the desecration of Kah-to-Bey's final resting place (he does have a point, if you think about it), Hasmid uses the sacred scroll to revive the mummified body of Prem, who sets about killing the members of the tomb raiding party. This, of course, is effectively the template for not just for mummy movies in general, but also the later slasher sub-genre, with a masked killer hunting down and dispatching members of a transgressive group in creatively violent ways. OK, we're not talking Friday the 13th here, but the killings are still memorable, with one victim burned alive when a bottle of acid is broken over him (quite how a four thousand year old Mummy was able to read the label to identify its contents is another matter entirely) and another wrapped up in makeshift shroud of his own bedclothes and hurled through a window into the street below. One problem here is the mummy itself. Just as their monster make-up grew steadily weaker over the course of Hammer's Frankenstein films, the plaster face and painted mouth of this particular creature (played by stunt man Eddie Powell) is a poor substitute for Karloff or even Christopher Lee. It doesn't help that he is sometimes bathed in light when it would have been more effective to have him lurking in the shadows, something particularly true of the climactic confrontation, which is lit almost as brightly as a 70s American TV drama, robbing the scene of its supernatural overtones and rendering the Mummy instead as a lumbering, damage-resistant, heavily bandaged lout. Fortunately, compensation is provided by an engaging ensemble cast. 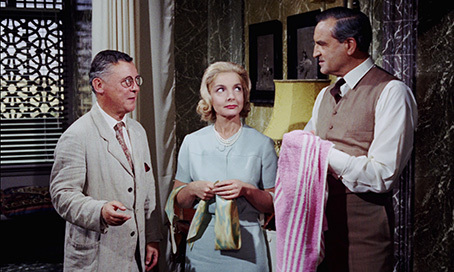 John Philips makes for a suitably pompous Preston, the one member of the party you find yourself willing the mummified Prem to slap six ways from Sunday, and the frosty disdain with which his wife Barbara (a fine Elizabeth Sellars) speaks to him provides its own telling back-story. As he did in The Reptile and Plague of the Zombies, Hammer stalwart Michael Ripper shines under John Gilling's direction, transforming Preston's pathetic and downtrodden assistant Longbarrow (great name) into the film's most sympathetic and ultimately tragic character. But almost stealing the film in just a modicum of scenes is the splendid Catherine Lacey as the wild, creepily melevolent but everso slightly anachronistic Haiti, a grizzled Romany clairvoyant with a voodoo-esque name who cheerfully predicts the deaths of others with the aid of a crystal ball, a Celtic invention that appears to have made the journey from Britain in advance of the archaeological party. There's even a low-key comic turn from John Garrie as an Arab cleaner that is well enough handled enough to prompt smiles rather than groans. 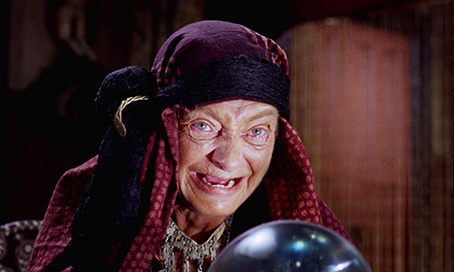 Despite its many charms, The Mummy's Shroud is some way from top-drawer Hammer; it certainly took me a couple viewings to really appreciate its more positive elements. Gilling's direction is peppered with effective touches – from the extreme close-up of the eyes of a victim whose head is being crushed to the Mummy's sudden appearance at the half-blinded Longbarrow's door – but still lacks that magical touch that made his Cornish double such standout films for the studio. There are better mummy movies out there, but for The Mummy's Shroud has more going for it than its past reputation might suggest. As with the previous Hammer restorations carried out for Studiocanal, the 1.66:1 transfer here will be something of a revelation to those who came to Hammer Horror via cropped late night TV screenings. The level of detail is consistently impressive, though is never quite as eye-popping as on the best of the Studiocanal restorations, and while the contrast is nicely balanced, there is some small variance here, resulting in the occasional loss of fine detail on brightly lit white areas. The colour scheme accurately captures the distinctive look of the studio's work of the period, and the brighter colours – notably the red light that bathes a photographic darkroom – are vividly reproduced with no sign of bleed. For the first time in this series, there is no information on the restoration included on the disc. The Linear PCM mono track is in reasonable shape, with clear reproduction of dialogue and music, though there is a detectable hiss lurking in the background, which occasionally is joined by a muffled crackle. How audible it is will depend on the volume of your amp, but it's never a major issue. Always a highlight of the Studiocanal restorations are the retrospective documentaries directed by Marcus Hearn, and this one is up to the usual standard, exploring as it does the production and effectiveness (or otherwise) of this sometimes critically maligned film. Contributors include A History of Horrors author Denis Meikle, Studies in Terror: Landmarks in Horror Cinema author Jonathan Rigby, and John J. Johnston, who as vice-chair of the Egyptian Exploration Society is someone you'd expect to pick holes in the film, but is actually a big fan. Actress Madeline Smith remembers actor David Buck, to whom she was married for the final six months of his cut-short life, and who here plays Stanley Preston's morally upright son Paul. A rolling gallery of posters, front-of-house, production and behind-the-scenes stills and cast portraits, underscored by snippets from the film's soundtrack. Original American release trailers and their reconstructed equivalent (recreated using the restored print and new graphics, but precisely emulating the original in all respects) for The Mummy's Shroud, Rasputin the Mad Monk, The Reptile and The Devil Rides Out (under it's meaningless American release title of The Devil's Bride). All are of interest, but the Rasputin trailer has to be seen and heard to be believed, with an increasingly hysterical narrator reminding the cinema (sorry, 'theater') audience to make sure they get their free Rasputin beards, which are also available in blue. Not one of Hammer's best, and not even one of Hammer's better mummy movies, but is still more entertaining than the critical drubbing it received on its original release suggests. Another solid restoration and transfer from Studiocanal (just who carried out the restoration this time is not specified here) is supported by another enjoyable and informative retrospective documentary. This is probably one for the Hammer aficionados only, but they may well treasure it on this condition.